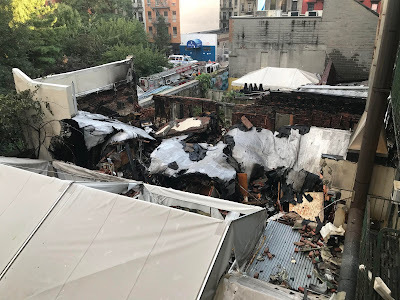 EV Grieve: After the fire: A look at 188 1st Ave.
After the fire: A look at 188 1st Ave. Here are several afternoon and early-evening photos from the fire scene at 188 First Ave. between 11th Street and 12th Street. 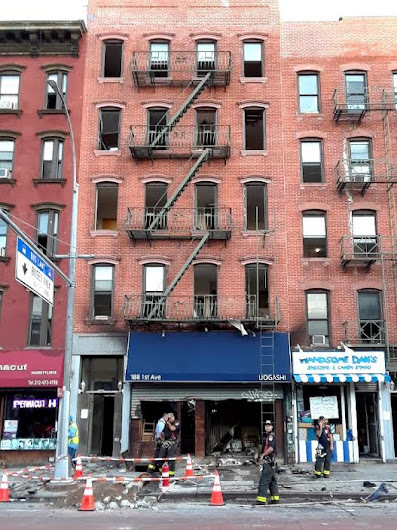 The top photo via Lola Sáenz shows the building at 6:15 p.m.
To recap various published reports, the six-alarm fire broke out just before 2 a.m. at the five-story 188 First Ave. Firefighters had the blaze mostly contained by 8 a.m. 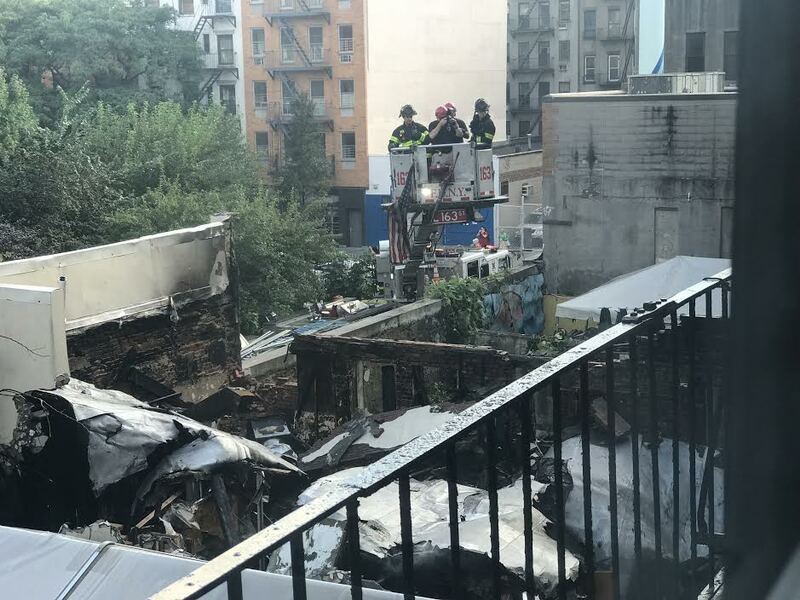 However, crews were still fighting flames into the early afternoon in a structure that had partially collapsed behind No. 188. Officials said they believe that the fire began inside Uogashi, the restaurant on the ground floor. No word on the cause just yet. In total, there were 17 reported injuries, including 14 firefighters. None of the victims sustained life-threatening injuries. According to ABC 7, three of the buildings that were evacuated will remain empty until the DOB checks the structural integrity. The Red Cross is housing 13 residents. So sorry to see this. It looks like people lost everything. If any of them are rent stabilized, they should file a form with DHCR that allows them to pay $1 a month to retain the right to return to the building after it is renovated. They can contact GOLES or Cooper Square Committee for advice. 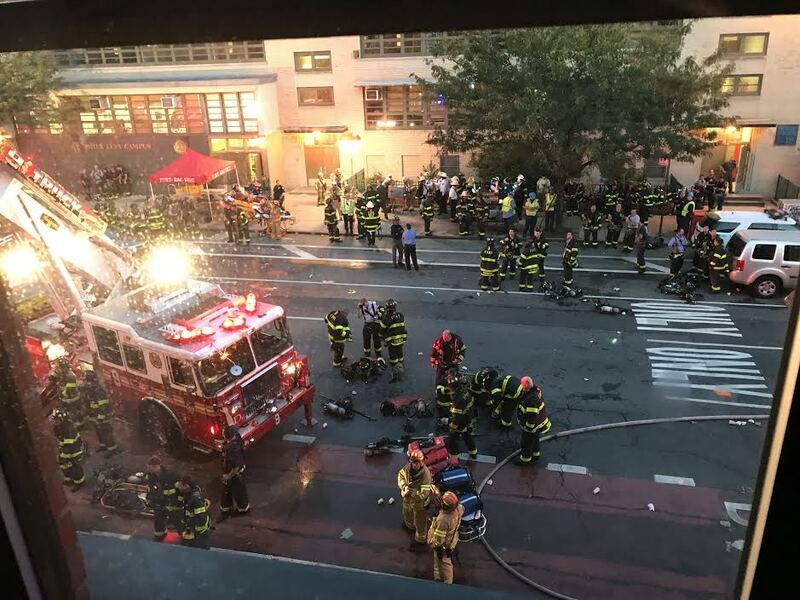 Heard the first sirens just as I was going to bed, they fought all night and 14 firefighters injured - can never thank them enough for what they do. Excellent advice. Mebbe someone who lives around where tenants are being housed can make sure these poor traumatized people know what to do. I'm not in town. Burnt out..so.sad. Was this the fortmer Neptune spot? The Neptune was at 192 First Ave. ... where Chelsea Thai is now. 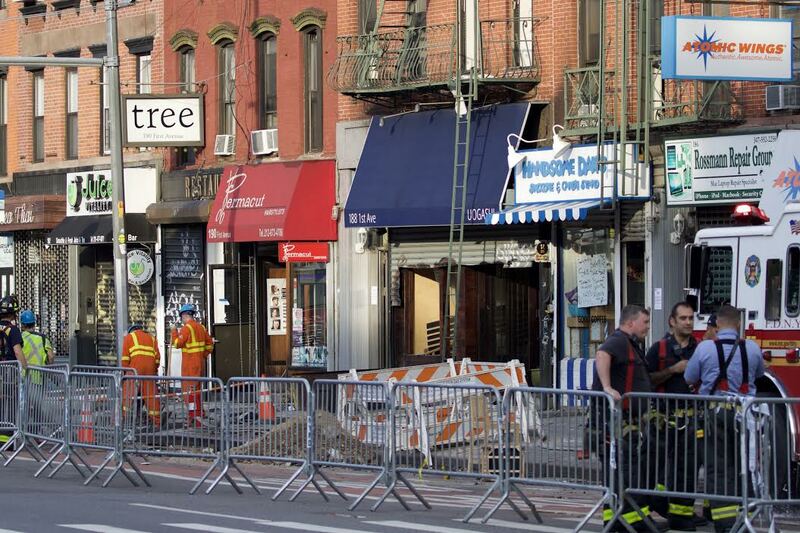 They should be back open as soon as the power returns to this grid. 10:33pm works for or knows someone who works for Google? Why did you, 10:33pm, feel the need to defend Google in your comment? They collect data and gather private information based on internet browsing and email or something? 'Know who's a real friend? Duck Duck Go. Whoever doesn't want to use Google as a search engine any more use that for your search engine.